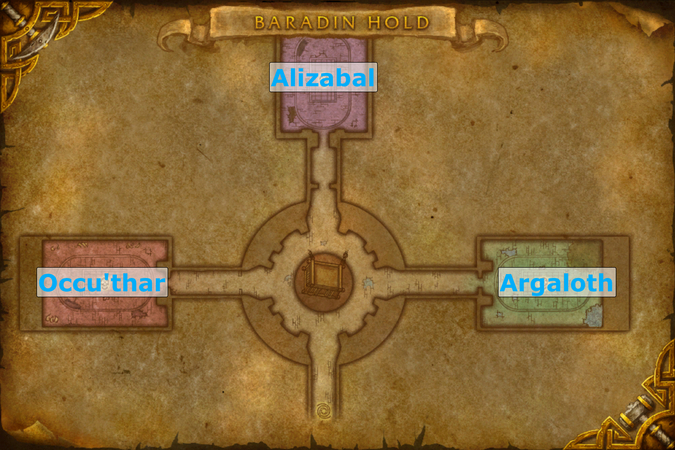 Baradin Hold is a 10 and 25-man raid instance located in the Tol Barad Peninsula. It was introduced with the release of World of Warcraft: Cataclysm, containing a single boss encounter: Argaloth. The release of Patch 4.2 has also seen the introduction of a new boss, Occu'thar, intended to give players an updated challenge for a chance at even better loot rewards, corresponding to Tier 12 levels. Patch 4.3 added the third and final boss encounter of the instance: Alizabal, Mistress of Hate. This boss gives players a chance to obtain certain Tier 13 set pieces as well various PvP items for the Arena Season 11. The instance layout is extremely simple, and there are minimal amounts of trash which do not pose any problems.